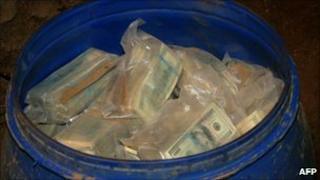 Police in El Salvador have found a plastic barrel stuffed with $9m (£5.8m) of suspected drug money on a farm in the centre of the country. Money crammed into a second barrel found nearby is still being counted, police said. Neighbours had reported "strange movements" on the farm in Penitente Abajo, the attorney general's office said. Police are still searching the area for money, weapons and drugs. The two barrels were found buried five metres (16ft) away from each other on the Hacienda El Recolado which reportedly belongs to a Guatemalan national. It took the police two days to count the bundles of $100, $50 and $20 notes in the first barrel. "If it turns out that this is the money of drug traffickers, this would be the biggest blow to organised crime in the country," El Salvador's Justice Minister Manuel Melgar said. The authorities have brought in heavy equipment to dig up the grounds of the property. According to local media reports an informant told police that $30m were hidden on the farm.